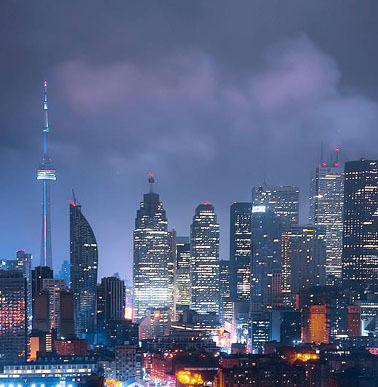 It fits with the “global village” that the Edmonton-born Marshall McLuhan began to talk about in the 1960s. And this has come to echo loudly in the now very diverse City of Toronto where he ended his life (and where I live today) — and in various other places around the world. At the same time, when I finished Masha Gessen’s piece I also found myself remembering Robert Frost’s wonderfully memorable poem of early 20th century New England, “Mending Wall.” It seems to have some particular relevance for the USA today, even though it was written more than 100 years ago. Frost’s poem captures something quite deeply rooted in the modern American experience, I think. And it is one of Donald Trump’s undoubted if still largely mystical talents that he has a crude but sometimes deadly instinct for appealing to such things. 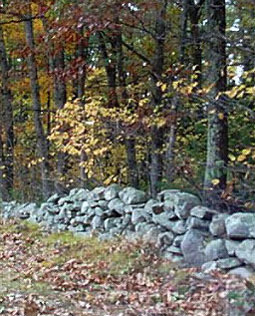 “Mending Wall” was written not long after the decade when Robert Frost was living on and intermittently working a small poultry farm in New Hampshire, not far north of the city of Lawrence, Massachusetts — where Frost grew up after his family moved back east from his San Francisco birthplace, when he was 11 years old. Frost farm in New England autumn today. 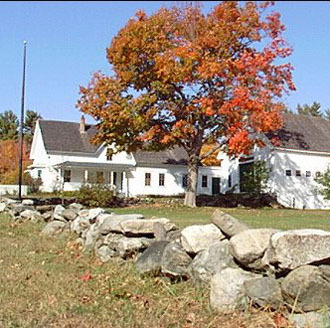 For better or worse, this place has now been restored as a “Frost Farm” heritage site, and you can still see the stone wall that appears in “Mending Wall.” Very briefly, the poem is about a conversation between farmer Robert Frost and his neighbouring New England farmer, as they go about their annual exercise of repairing the wall between their two properties. Frost in this setting is not just a farmer. 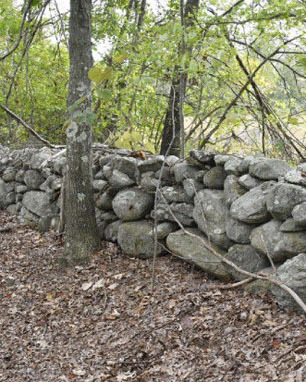 He is also a poet, of course — and in fact a local schoolteacher “at nearby Pinkerton Academy.” Unlike his more rigorous farming neighbour he has poetic doubts about the real utility of the annual exercise of stone fence repair. “Just another kind of out-door game”? 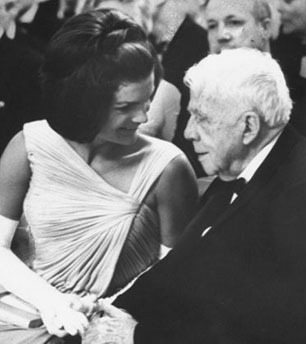 Jackie Kennedy with Robert Frost at White House party for Nobel Prize winners 1962. It is similarly not for nothing that Robert Frost, who was born in 1874, finally ended his long public career as the American poetic guru of the all-too-brief Jack and Jackie Kennedy liberal nirvana in Washington, DC, subsequently known as “Camelot” after a Broadway show. 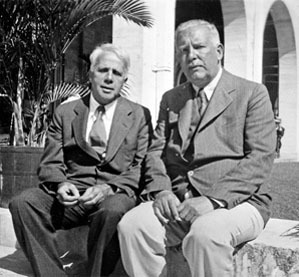 In the very end, however, Robert Frost was also a poet with a serious grasp of the real world of the United States of America that he knew and understood first hand, from his birth on March 26, 1874 to his death on January 29, 1963 — about 10 months before the assassination of President Kennedy in Dallas, on November 22, 1963 (when Camelot came to a sudden end). “Good fences make good neighbours”? Frost was finally under no illusions about the traditional New England values that were still deeply embedded in his strictly farmer neighbour’s American soul. In “Mending Wall” the poet finally acknowledges that there is no workable way he can successfully communicate his doubts about the real need for the wall in the first place to his neighbour. With his otherwise near-insane concept of building a wall along the US-Mexico border, Donald Trump is appealing to this deeply rooted “Good Fences Make Good Neighbours” concept of the modern American mind, as it moved across the continent from the early 17th to late 19th centuries — from the Boston where Robert Frost died to the San Francisco where he was born. As various other places on the net have already suggested (or otherwise implied), today in 2018 someone ought to put out a rap version of? Frost’s “Mending Wall” (said to have been written in 1913, during his three-year literary sojourn in the countryside near London, England). The poem outlines a debate about borders, fences, and especially walls in early 20th century New England that has striking similarities with a debate about borders, fences, so-called “immigration,” and walls Mexico was supposed to pay for in the early 21st century USA. The biggest question is who will the sovereign people finally vote for — in the first instance this coming November 6, 2018? Robert Frost or his neighbour who will still “not go behind his father’s saying”? And in the real world today maybe that does mean it’s a good thing “Trump’s Opponents Aren’t Arguing for ‘Open Borders’” (and neither exactly was Robert Frost in “Mending Wall,” just before the First World War, which really did change everything, everywhere, long, long ago … ).